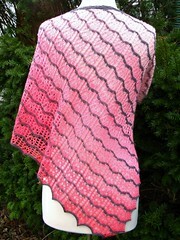 Last fall I started something new-to-me: sample knitting for another designer. Since then I’ve completed perhaps half a dozen projects for a staff designer at Plymouth Yarns. I really enjoy the challenge of knitting from a new pattern and working on a time table, even though sometimes the deadlines can be a little stressful. Working closely with an experienced knitwear designer has been educational and fun too. Best of all, this is paid work — the rate varies depending on the complexity of the pattern, but it is enough to make it worth my time. The hard part, like anything associated with designing, is waiting to talk about it! Today I can share photos of my 2nd project with Plymouth: the Vita Vest. 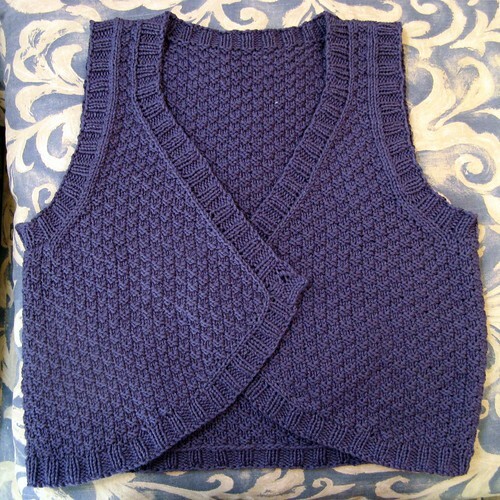 This was a cute little project — a simple pieced vest with all-over moss stitch. I liked the interesting shape as the hem curved up to mean the V-neck at a single button. The Vita yarn was a pleasure to work with: soft and drapey. I would say … intermediate knitter. There was nothing terribly tricky about it! 🙂 Give it a go!